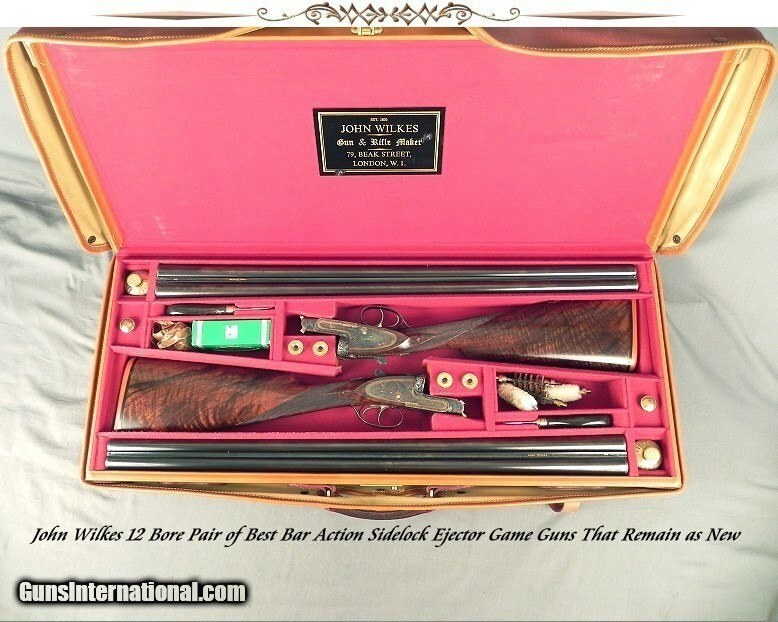 #15317 & 15318, John Wilkes, 79 Beak Street, London W1: A 12 Bore Pair of Best Bar Action Sidelock Ejector Game Guns Made in 1993 by John & Tom Wilkes that remain to this day almost like new, Both guns with 28" Chopper Lump barrels, Both London proved in 1993 at 850 BAR with 2 3/4" chambers; #1 gun at .728 .010 & .020" (Imp.Cyl. 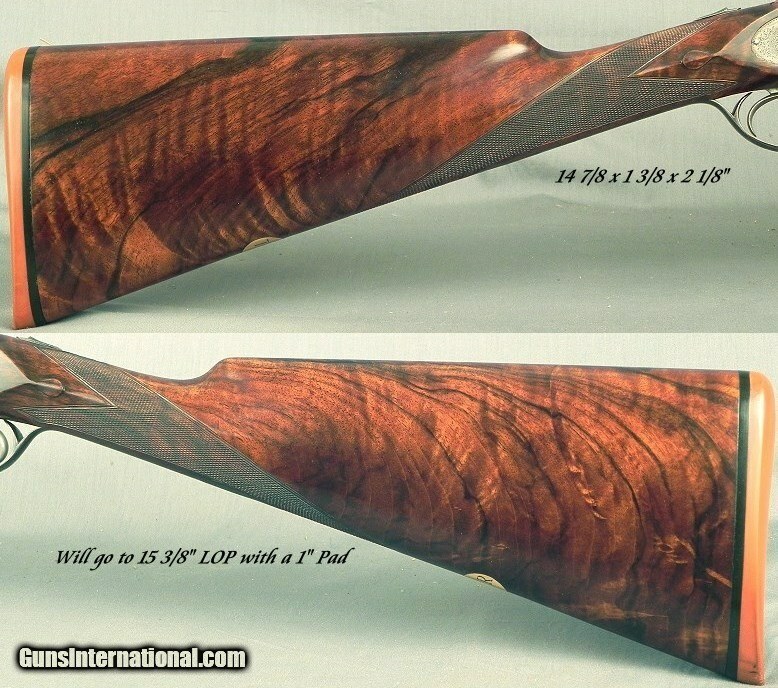 & Mod. 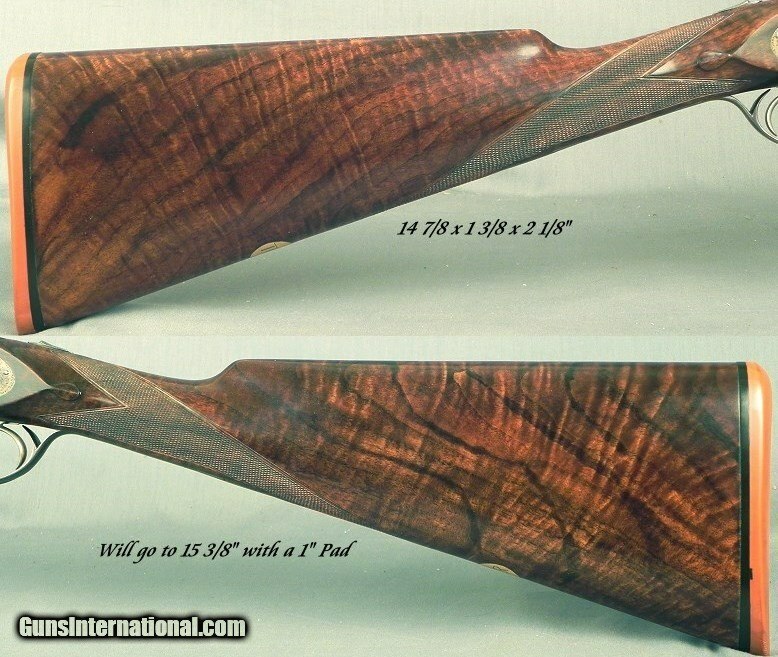 ), 2 3/4"; #2 gun at .726 .010 & .019" (Imp.Cyl. 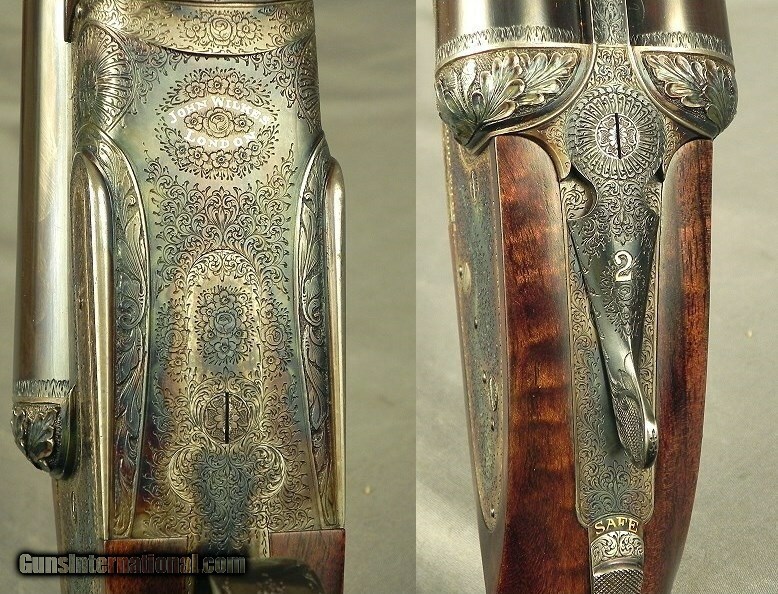 & Mod. 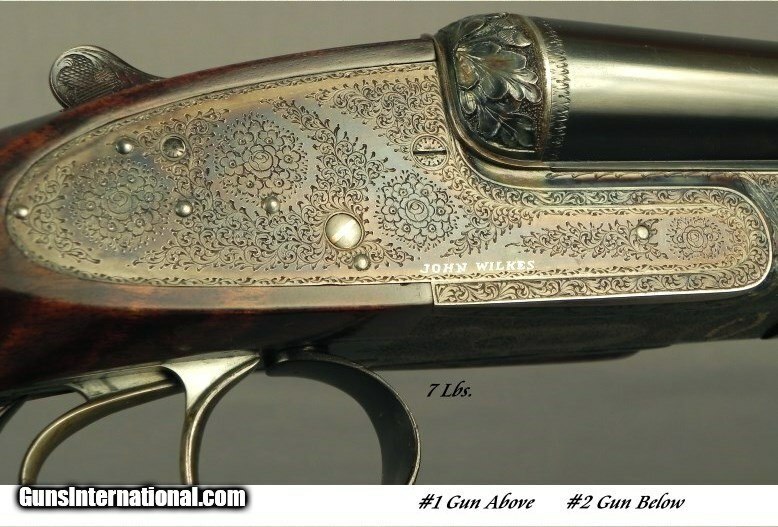 ), 2 3/4"; Double triggers, York & Wallin locks that are Gold plated as are the cocking rods, Splinter forend with an Anson frontal release, Straight hand stocks and both guns at 14 7/8 x 1 3/8 x 2 1/8" over a 1/2" Silvers pad, They will go 15 3/8" LOP with a 1" pad, Neutral stock for the right or left hand, Rolled trigger guard edge for the right hand, Both guns straight up 7 lbs., Very nice wood with excellent black/brown contrast, 98% coverage of well-cut rose & scroll engraving, The inside of the forend has very nice coverage of matching engraving; The John Wilkes name in Gold on all the lockplates, the barrels and the bottom of the action, These guns are totally original as made in 1993, The barrel blue of both at 99%, The case colors by St Ledger remain at 99%, The stock finish remains an honest 99%, The checkering is 100%, The bores remain as new on both guns. They are cased in the makers leather trunk with a canvas cover and a full set of accessories including engraved oil containers. 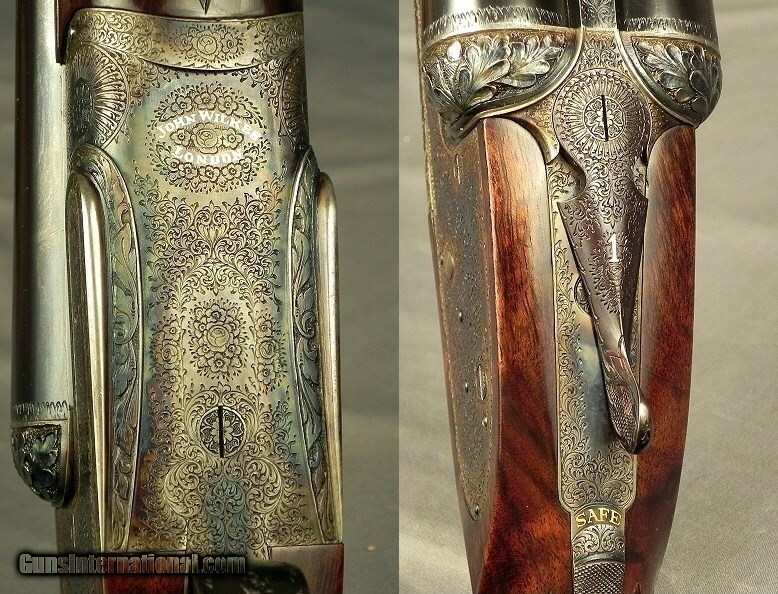 A pair of guns that remain nearly as new and represent a very fair value. 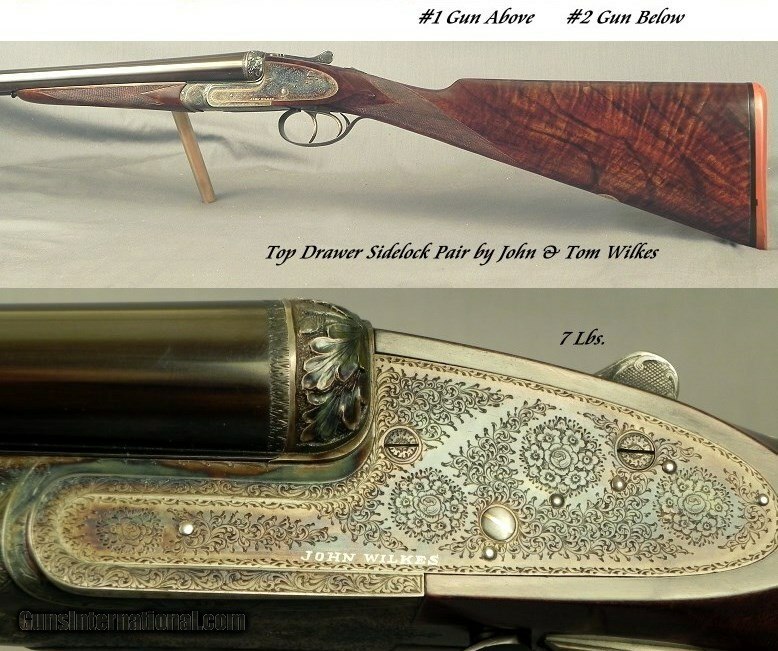 The gunmaking firm of John Wilkes was established in Birmingham, England about 1830. In 1894 they were at James St. in London and in 1913 they moved to 31 Gerard Street where the firm stayed until 1925, followed by a short period at 21 Broad (now Broadwick) Street both in Soho. 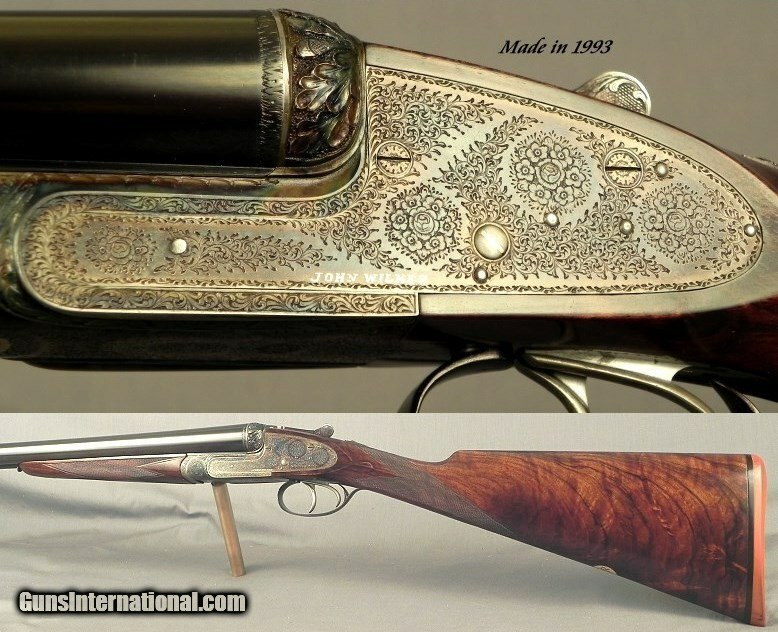 Wilkes then moved in 1927, John Wilkes senior died in 1927, to 79 Beak St., Soho, where the firm would remain for the next 78 years with John & Tom Wilkes carrying on the family business of 5 generations until July 2003. 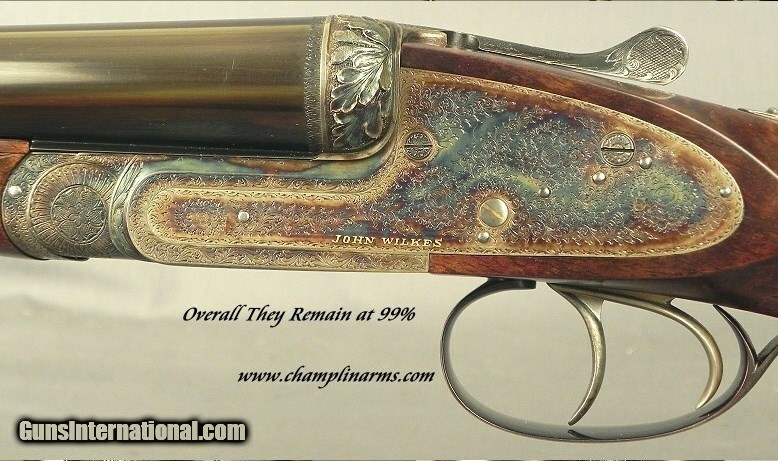 They remained a Wilkes firm in the Soho district for 109 years. 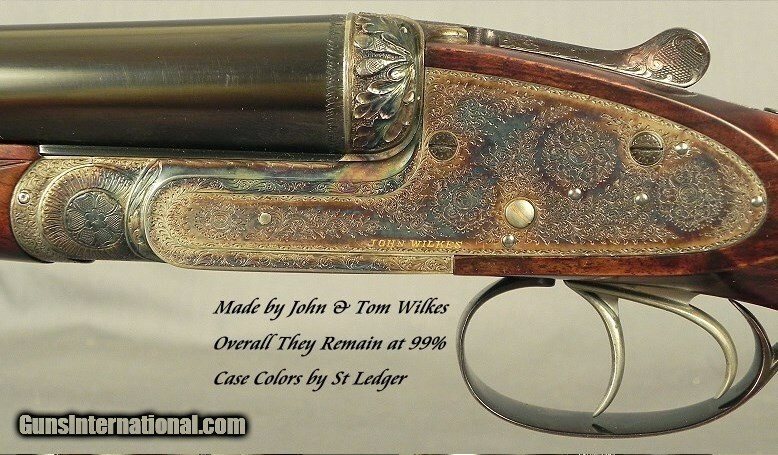 To this day Craig Whitsey, who had been with the firm for 30 years, is continuing the running of the John Wilkes business, from his workshop in Arundel, West Sussex and can be found at craigwhitseygunmakers.co.uk. 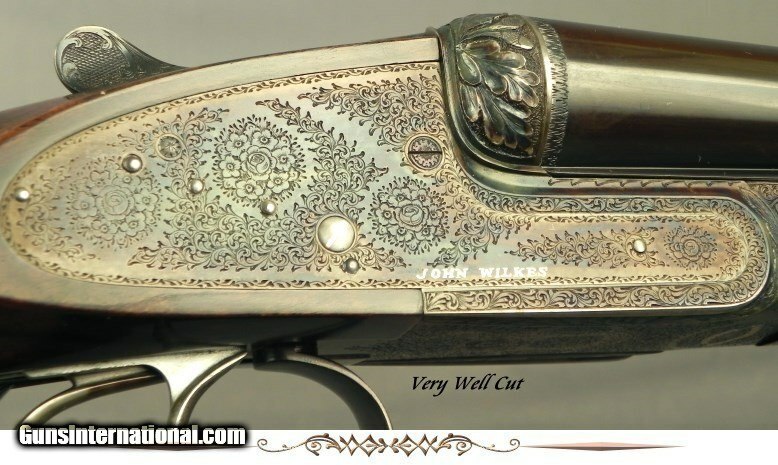 Stephen Grist in writing about the history of Wilkes Gunmakers stated, "Wilkes guns of the period, producing some really top quality sidelocks, but also, more unusually, a number of truly best boxlocks, of a quality and style that have never been bettered by anyone, a fact well known in the Trade".